Thank you for voting on Question 4. Your vote has been registered. Please close this window and vote on Question 5. Question 1: Do you support the wider vision for the Wolf Business Park to redevelop the site and deliver bespoke employment units alongside a new Lidl neighbourhood food store? 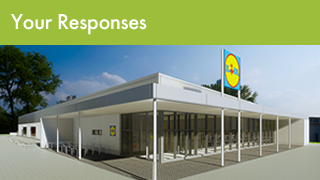 Question 2: Do you think a new Lidl supermarket would be a benefit to the area? Question 3: Do you think there is a sufficient choice of supermarkets within the local area? Question 4: Do you currently do your supermarket shopping in Ross on Wye? Question 5: Do you think the provision of new and enhanced business premises would be beneficial to the local economy of Ross-on-Wye?